Reminisce about the days when you took milk cartons, paper towel rolls and, yes, even toilet paper rolls to school for a fun craft project. 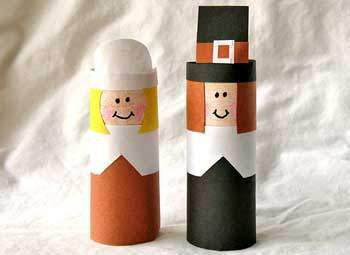 These Thanksgiving pilgrims are made from the simplest materials – cardboard tubes, construction paper, glue and crayons. What we love about this craft is that it’s great for the kids, but adults can also get very creative by applying embellishments. Use them as placeholders, napkin rings, or simple decorations for the dinner table. We’d love to see your finished project.